Many of us and even more of our children enjoy sports and athletics. But games can come with a health price, and that price can be paid in dental damage. And according to the Australian Dental Association playing sports, particularly contact ones, without a mouth guard can be a recipe for dental disaster – as jaws can be broken, teeth lost, and concussions suffered. Fortunately, a custom-made mouthguard can help protect against these dental emergencies. A proper mouthguard is a custom-fitted device that goes over the teeth and protects them from damage. At Cardiff Dental we believe that mouthguards are a vital piece of athletic gear for athletes of any age. And Sports Medicine Australia (SMA) and the Australian Dental Association (ADA) agree, having collaborated on a policy that mandates mouth guards for registered players during training and games for sports including boxing, football, basketball, wrestling, hockey, martial arts, netball, and lacrosse. Wearing a mouthguard during practice and play can help athletes avoid damage to teeth, gums, lips, and face. Athletes are 60 times more likely to suffer harm to the teeth when not protected by a mouthguard. Dental injuries incurred during sports or athletics add up to more than 600,000 emergency room visits each year. Estimates are that mouthguards prevent more than 200,000 injuries each year. Athletes who use generic mouthguards are twice as likely to suffer a concussion than those who wear custom built mouthguards. Mouthguards prevent broken or dislocated teeth by cushioning the teeth. Opposing teeth are kept from contacting each other. The lower jaw is cushioned, so the impact to it does not fracture or damage it. Mouthguards can help avoid brain injury. Mouthguards stop the jaws from violently jarring together, which can result in concussions. Mouthguards can also protect against neck injuries. Mouthguards help athletes feel more assured and protected. There are three basic levels of mouthguards, from over-the-counter to customised versions. Pre-formed mouth protectors, which are available over the counter at many pharmacies and sporting goods stores, come ready to put into our mouth and play. While they are usually quite inexpensive, they are also one-size-fits-all, and mouths and teeth are all different. Pre-formed mouth protectors are bulky, make talking difficult, and provide little or no protection. 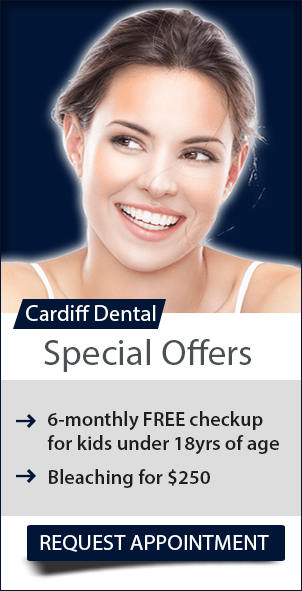 While they are better than nothing, Cardiff Dental does not recommend them. Boil and bite mouth protectors can also be purchased at sporting goods stores. They are softened in hot water and then placed over the teeth and moulded to them. They are a bit better than pre-formed mouth protectors, but they still don’t provide maximum protection. Custom-fit mouth protectors are made for the individual using special materials in a dental office. These mouthguards are more expensive than the others, but they provide the most comfort and protection. It can be challenging to persuade athletes to wear mouth guards. Pre-formed and boil-and-bake guards can be awkward and uncomfortable. Custom fitted mouth guards have a comfort level that is dramatically improved, and they can be customised with team colours, logos, etc. Research shows that custom fitted guards can improve athletic performance! Mouthpieces keep athletes from post-workout levels of high cortisol, which attacks protein. Custom mouthguards don’t shift around in the mouth or obstruct breathing. Because custom mouthguards allow easy breathing and speaking they allow athletes to feel confident in their performance and endurance. For optimal protection, custom mouth guards are the only choice. They offer the best defence against potential injuries to teeth as well as gums and orthodontic hardware. And when orthodontics are involved, custom-made guards provide improved protection and prevention against possible oral lacerations caused by the braces themselves. Custom mouthguards even offer some protection against concussions. The expense is an important factor when considering athletic kit, custom mouth guards included. But the potential negative consequences of generic mouth guards are massive. Without custom fit and proper protection, dental injuries (and emergency dental or medical care) are far more likely. Given the potential cost of dental trauma, custom mouthguards are a minimal investment as opposed to the cost of unexpected medical bills. For more information on Custom-Made Mouthguards call us on (02) 4954 6888 or visit us at 34B Kelton Street in Cardiff. Keeping Kids Smiling: Child Dental Benefits Extended For 2017!